With saddened hearts we say goodbye to a special friend. 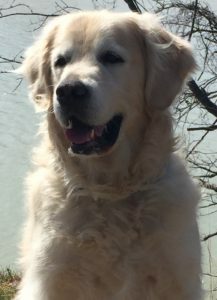 We recently learned about the passing of Stanley, a beautiful Golden Retriever who we had the privilege of meeting and taking care of on our 4th house sit in Port Dalhousie, St. Catharines Ontario. C.J., my husband, especially enjoyed taking him for walks. Stanley needed some gentle guiding as he became blind when he got older. When he backed himself into a corner and couldn’t see his way out – literally – we would steer him the right way. However, we did not realize just how special Stanley was. 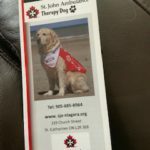 Stanley was trained with St. John’s Ambulance as a Therapy Dog and worked for five years comforting hundreds of people, the sick, the elderly and the young. He could be found at a hospice or at Brock University helping nervous students about to write tests, or helping many children overcome their fear of dogs. His gentle and loving ways brought many smiles and a peaceful easy feeling to those around him. Because of his endless hours working with Hospice and his community, he was given many honours and awards. Stanley was one of a kind and will be sorely missed by all who had the chance to meet and get to know him. He certainly touched our hearts in the short time we knew him. Our heartfelt thoughts go out to Liza, Tom, and Sophie who shared their boundless love with him, especially in his last few days. Note: If in Canada and you would like to have your dog considered as a therapy dog, read this article for more information and if in the U.S. you can learn more here. I love to travel and my biggest regret is that I waited so long to do it, thinking I just couldn’t afford it. I have had some crazy fun, some scary moments, such as getting locked in a shower at a campsite, and met some amazing people. For our trip to Mexico we were able to save money by house sitting, which was something completely new to us. If this is something that interests you, then check out TrustedHousesitters. We hope you visit often. Awwww thank you so much Mary Ann for that touching tribute. It certainly is a testament to how deeply he affected others. It was my pleasure, Liza. He was a beautiful dog and as you said, he affected so many others he encountered in his life. We are so looking forward to seeing Sophie again! What a beautiful tribute to a great pup who served and loved others endlessly. It’s hard when they pass away or have to be put to sleep. I’m glad you guys had the opportunity to meet him and help him. Each of our pups have unique personalities and hold a special place in our hearts that no other pup can replace. What a great tribute, Mary Ann! Thank you Christine. He was such a sweetheart. I don’t know how Sophie (his canine companion) or his humans, will do without him. We are very glad we got to spend some time with him even though it was only for a short while. Stanley was very special. Data found will be sent to your email address and allow you to be put in an additional request to have the data anonymized.